Profiles let you find or link to any piece of information you have about a person. You can find a person's profile by typing his name in Search or by clicking his any place you see it linked. To get to your own profile, click My Profile. 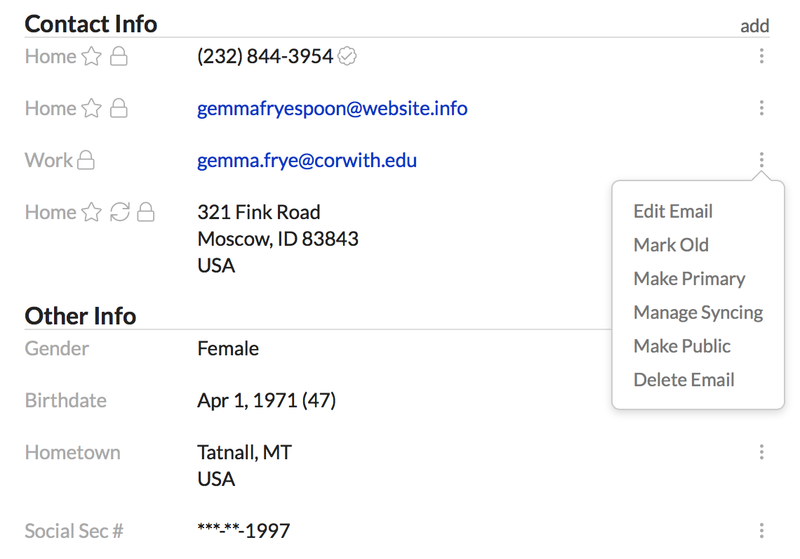 To create a profile for a person, just add that person to Populi (check that article to learn how to upload an ID photo and update the person's name). This article covers the Info view, which includes contact info, other personal info, user info, relationships, and organization info. Every profile includes the Activity Feed, Info (contact and other basic personal information), Campus Life, and Financial views. Active users have the Bulletin Board. Student profiles include the Student view; during online enrollment periods, you'll see the Registration view. Faculty profiles include the Faculty view, which shows all the courses ever taught by that professor. Admissions leads (and anyone who has ever applied to your school, including current students) show the Admissions view. Export ID card: This creates a PDF of the person's school ID card. The ID card identifies them by whether they are Staff, Faculty, Student, or Library Patron (the ID card doubles as a library card). Delete this person: If there's no good reason for this person to be in your system, here's how to deal with them. Don't do this unless you really need to! 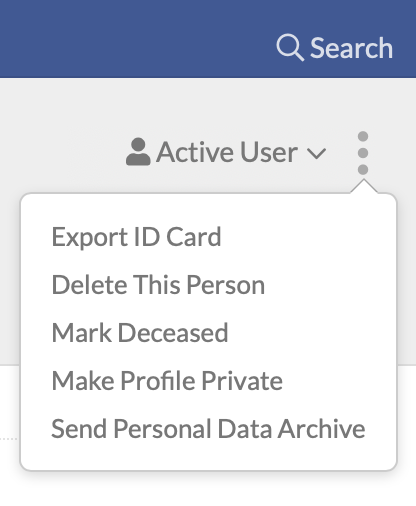 Mark deceased: Marking a person deceased removes his user access, deactivates all of his user roles, and removes him from all mailing lists and other mass communications. If you've made a horrible mistake, you can come right back to this menu and click Mark not deceased (you'll then need to give him user access, re-activate his roles, and add him back to any mailing lists, etc.). Make profile private: This option hides the profile from all users except for Staff, Faculty, and the student's currentAdvisor (if any). Any Staff member can set a profile to private. Only Academic Admin users can set a profile back to public. The Populi Name is the name that displays in most places in Populi—reports, course rosters, discussions, etc. It is made up of a person's first or preferred name followed by the last name. By clicking the Populi name—it will toggle over to show the person's full name. By going to your personal settings and selecting Yes under the Show full name... setting. To change a person's Populi name, hover over the name and click edit; you'll see a field for Populi name. You'll see the person's User Roles right below their ID Photo. A check indicates that a given role is active for the user. Only people with the Staff role can change user roles. No one can add a role with more permissions than their own. For example, a Student Billing user can't add Financial Admin to another user (let alone himself!). Users can't give out roles that aren't in their "wheelhouse"—that is, an academic user can't dole out financial roles (and vice versa). 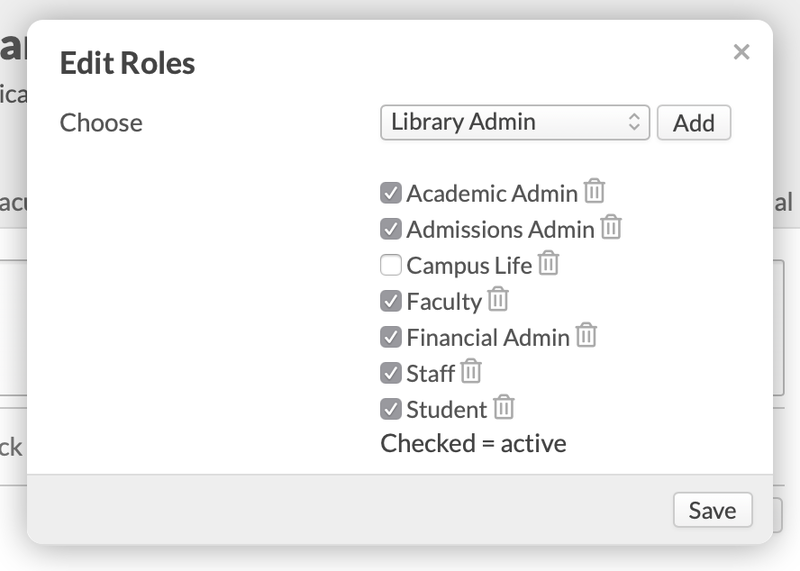 If you haven't looked at it yet, the User Roles article describes which roles you can add to yourself or other users. Choose a role from the drop-down. Check/uncheck a role to make it active/inactive. Click to remove a role altogether. You'll see a list of tags right below user roles, including system tags and custom tags. System tags are added and removed when the person triggers it—for example, when a student passes the credit threshold for the "Senior" standing, he loses the Junior tag and gains the Senior tag. Custom tags, on the other hand, are manually managed and can be updated at any time (you can also add them en masse in the Data Slicer). Start typing in the field. 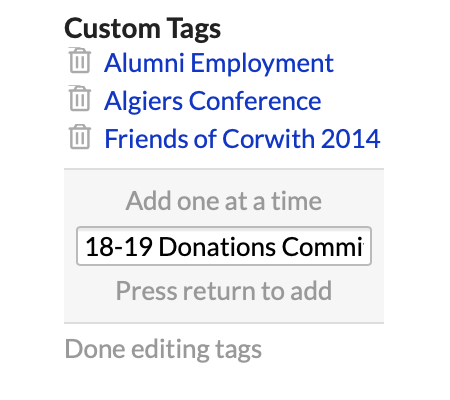 You can add a new custom tag, or select from the existing custom tags that come up as you type. Click Add to list the tag. A new tag field will open below the tag you just added. If you need to add more tags, just keep typing. If not, then just ignore the new field. It'll waste your time; if you type a tag that is the same as a system tag, it won't be added. System tags are automatically applied when something triggers them. Creating a similar tag only duplicates information that could be a problem later. Click to remove a tag. When you're done, click Done editing tags. Click add next to Contact Info. Select the contact info type you'd like to add. Select the type (Home, Mobile, Other, etc.). Click to see your options for updating or using a given contact item. Your options will differ depending on the contact item's type. Primary indicates that Populi defaults to this particular contact item when you communicate with someone or export their contact info. For example, when you click to email the person, Populi will send the message to her Primary email address. 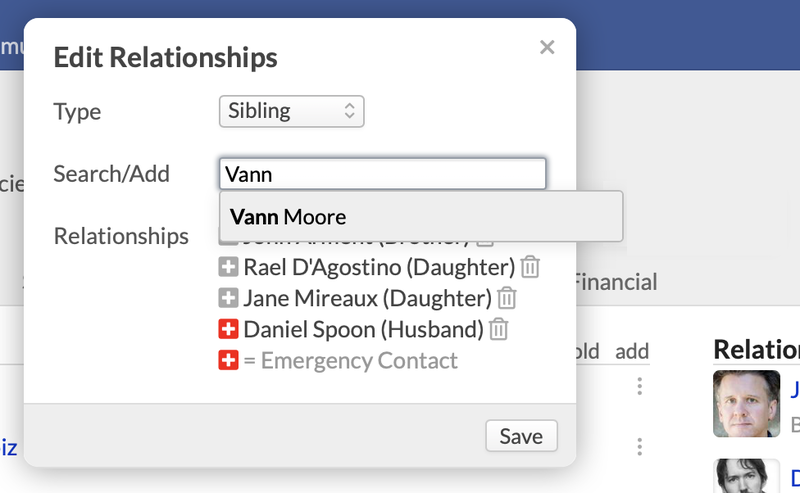 Syncing lets you share a contact item between the person and one or more of the people listed under her Relationships. Private contact items visible to users with the Staff, Faculty, or Advisor role—but they are not visible to users who only have the Student role. Public items are visible to all users. Mailing addresses give you the option to print an envelope or mailing label. Mark old: Mark an item as old and it will be hidden from view. If items are marked old, you can click show old and mark old items as current. You can, of course, edit or delete any contact item. Click add next to Other Info. Choose the field you'd like to add. If you want to add a custom field, click Choose a custom field and then select the custom field you'd like to add. To delete or edit a field, click to see your options. To read about how to use Populi's GDPR lawful basis tracking feature, have a look at this article. This article describes what you can do with user access: granting it, removing it, and blocking it. You can sync their contact info. Student parents get the Parent of... system tag, letting you easily include them in mailing lists and other communications. Mark one of the related people as an Emergency Contact. Click Add a relationship or edit. Choose the relationship type. There are many to choose from! Start typing a name and choose from the results. You can also add a new person here—just enter a first and last name. Try not to add duplicate people! If you enter a name and an existing person comes up, that's probably who you want to add here. Repeat these steps as often as you need to. Click to mark someone as the emergency contact. Click to remove a relationship. Organizations are the schools, businesses, and such with which your school has some association. 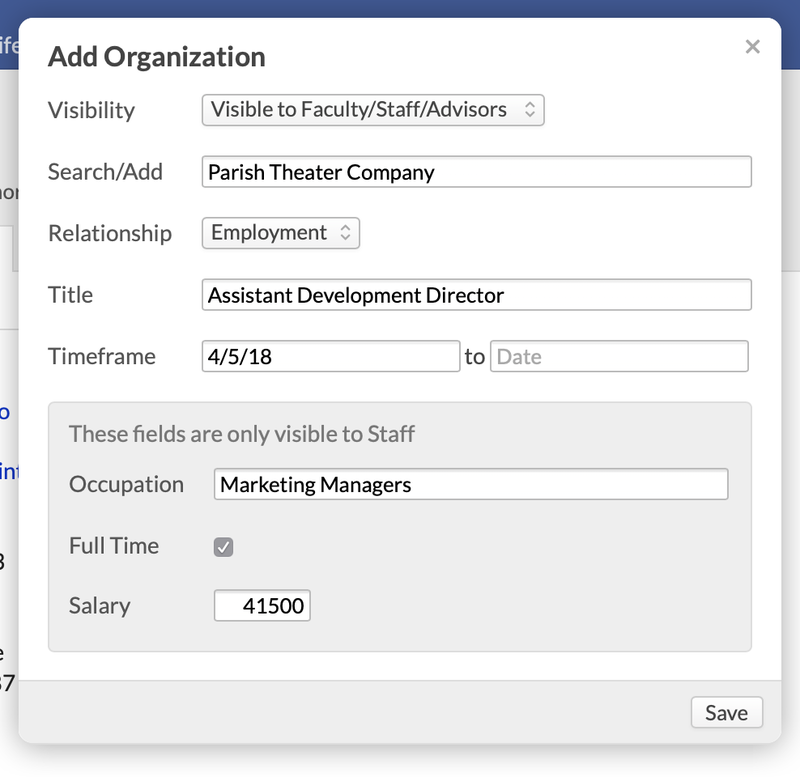 You can link people to organizations as members, employees, and students. Start typing an organization name and choose from the results (You can only add organizations that are already entered in Populi). Select the Relationship—Member, Employment, or Student. If you choose Employment, you'll be able to enter details about the person's job—occupation/CIP code, full-time, and salary. You can also enter Title or Field of Study. Enter beginning and end dates for the timeframe. Leave the end date blank if the person is still involved at the organization. Click to mark this organization as primary. When you do so, the organization and title will display under the person's name at the top of the screen. Remove an organization by hovering over its name and clicking . "Private contact items are only visible to users with the Staff role; Private items are visible to all users." @Jessica - That sentence has one clause that is completely incorrect, and one with a pretty serious typo. We're thoroughly embarrassed, and will get those fixed.